Finally Wal-Mart had the Tylenol Muscle Aches and Body Pain in stock – was able to use up my last two coupons. Earned $0.33 cents overage each. 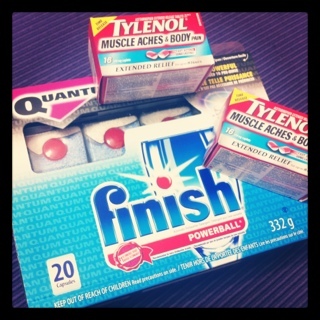 Also stacked $8.00 in Finish coupons in Save On Foods to get some very cheap – $0.49 before tax Finish Quantum Powerballs. 20 count. This entry was posted in canadian coupons, coupon stacking, coupons, free, save on foods, walmart and tagged canadian coupons, coupon stacking, coupons, free, save on foods, walmart on December 8, 2011 by Courtnie.